Freezing monsoon hurricanes might be a thing on the Steppe, but they’re not slowing down our girl one iota! HN’s own Leslie Wylie is attempting her most fearsome feat of #YOLO yet: a 620-mile race across Mongolia. Riding 27 semi-wild native horses. Carrying only 11 pounds of gear. Relying on nomads for food, water and shelter. On a mission to help stop deforestation. See our update on Day 1 here. Wildly unpredictable weather is one of the well-established hazards of the Mongol Derby, and this gremlin came out to show its ugly face to riders on day two. Hurricane-like wind, freezing rain so thick you couldn’t stand or see, and rising water levels all played a role in slowing some of the riders down to a near-crawl, but our own Leslie Wylie stayed on track to complete the next four checkpoints, ultimately stopping at Urtuu 7 for a night of dry rest. She currently sits in a virtual tie for second place with two riders making it to the eighth official checkpoint before nightfall, and she’ll spend the night with five other riders who reached stop seven with her and start off together in the morning. With riders starting out spread between 60+ kilometers between them, weather varied significantly at the start of the day, allowing some of the riders at the back of the pack to get going at 7am, while others — including Leslie — were held where they were because of torrential downpours and freezing, knock-your-pony-over wind. This compacted the field a bit, but ultimately riders at Urtuu 3 and beyond were finally given the green light around 7:30. We’ve since learned from race organizers that Leslie stayed in a Ger (Yurt) NEAR the Golden Meadows Shopping Mall of Mongolia, so she was warm and dry overnight, though sadly missed her shot at a morning pastry chain run. People obsessively watching the red dot known as Wylie were anxiously awaiting movement that didn’t come for hours before finally her GPS pinged again, showing her still at the top of the pack. When she finally reached the next checkpoint, her signaler was replaced, and this seemed to resolve her tracking issues moving forward. Over the next several hours, a few riders made their move: Rebecca Pumphrey — a British Talent Agent who lives in London — lead the pack for a brief period in the afternoon and is now one of Leslie’s overnight bunkmates at Urtuu 7. Ed Fernon leaves HS4 during day 2 of The 2017 Mongol Derby on 10.8.2017. in Mongolia. PC: Julian Herbert. 29-year-old Ed Fernon – an Olympic Pentathlete, long distance rider and avid mountain summiteer – came out of seemingly nowhere to jump into the lead alongside Marie Palzer, a 22-year-old New Zealander who works as a horse trekking company guide. The two rode the last couple of checkpoints together and checked into Urtuu 8 with just minutes to spare. 21 riders have time penalties, all but one of whom is at least two checkpoints back from the leaders. One rider, Warren Sutton of Australia, has a 2 hour penalty in Urtuu 7 (the same checkpoint as Leslie) and he will be held for two hours at Urtuu 11 when he arrives there. All the others have a bit of catching up to do in addition to their time penalties, but it’s still a long race to go and anything can happen. Noticeably, the riders at the front of the pack are succeeding not only at handling the weather, the horses, and the mapping, but also their timing – knowing when to attempt a leap to the next safe stop and when to hunker down. It will take all these skills and more to come out on top. 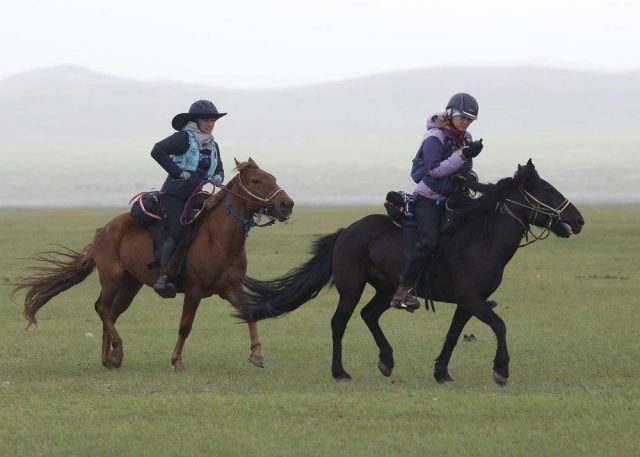 We were also especially pleased to see that the vet stationed at Urtuu 7 specifically mentioned Leslie and current bunkmate Rebecca for their top notch horsemanship. There have been a handful of hardships out there: The most serious to report is Julia Fisher (USA), a 65-year-old psycholinguist who fell from her horse near the first checkpoint and they suspect cracked a rib. She retired from the race and was transported to Ulaanbataar for a full medical evaluation. We send our best thoughts to her for a full and speedy recovery. Other trouble on course from day two included some shivering horses and riders who overnighted on the steppe, a lost sleeping bag (downright treacherous in these conditions), runaway mounts, and the first marmot hole victim, who went buns over teakettle into the turf, but got right back on, no worse for the wear. Almost all the riders made it to the next checkpoint to have a safe, dry sleep tonight, though some will accrue time penalties for riding over the cut-off point in order to make it there. There are three riders who stopped between Urtuus to hunker down overnight, and we hope very much that they found some shelter. We’re sending you guys warm thoughts! Forecasts for tomorrow are looking MUCH better, with some of the checkpoints already appearing clear, and the western checkpoints clearing up at around 2:00am. That doesn’t mean the weather can’t change in an instant out on the steppe, but hopefully it gives all the riders a chance to dry out and cover some ground. A heardsman gathers horses during day 2 of The 2017 Mongol Derby on 10.8.2017. in Mongolia. PC: Julian Herbert. It’s an incredible and diverse array of riders, and we’re crossing our fingers for safe rides for all. We send our appreciation to the event organizers and the local families and horsemen who are watching out for our blue dots. Go dots, and Go Wylie!